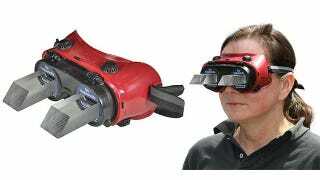 Wait, Why Do I Want Goggles That Show Me the World Upside-Down? Maybe I'm missing the boat here, or am too old to comprehend another bizarre fad, but I'm having a hell of a time trying to figure out why someone would want to wear goggles that make the world look reversed. Using a set of re-positionable plexiglass prisms these goggles can either show you the world upside-down, or left-right inverted. Perfect for those who find that alcoholic binges or bouts of the flu don't make them puke enough. Apparently they were actually inspired by an American scientist named George Stratton who found that after wearing similar glasses for four days, his mind adjusted to the inverted image and he could see the world the right way up again.